I know baking cupcakes in cones isn’t exactly a cutting-edge idea but it was new to me when I spotted a C & H Sugar tweet last month. 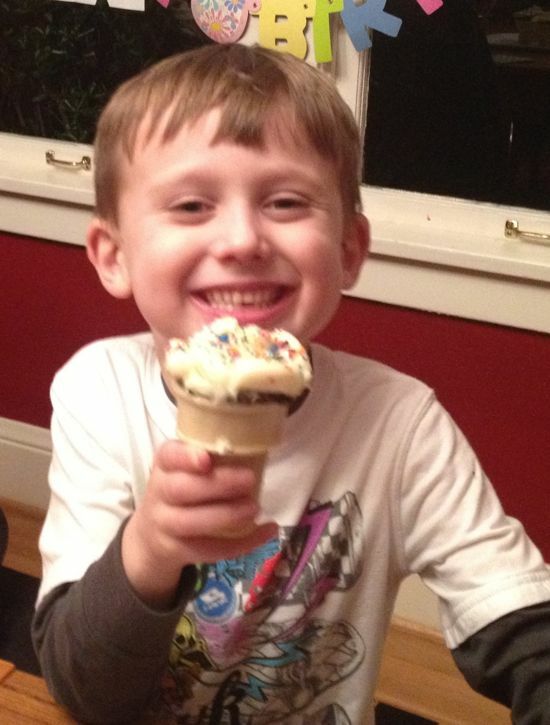 I knew immediately that these cone cakes would be an ideal birthday treat for a little boy who’s hard pressed to choose between chocolate “cuppy-cakes” and ice cream cones. I baked them on a whim, not sure that they would actually work even though there is plenty of evidence on the web that they would. My party co-conspirator even found instructions on YouTube – using cake mix batter and whipped cream “icing” from an aerosol can. The cupcakes turned out to be pretty simple, even if you mix up your own cake batter and frost them with homemade icing to mimic soft serve ice cream. The only tricky part is keeping the cones upright as you get them in and out of the oven. You can DIY a baking stand with aluminum foil but I found mini-muffin tins worked pretty well with less fuss. Just try not to overfill the cones or tilt the tins as you slide them into the oven. For these little cakes, I used a one-bowl batter recipe from “Martha Stewart’s Baking Handbook” (Clarkson Potter, 2005) that get its intense chocolate flavor from unsweetened cocoa powder (I like Droste). The flat-bottomed, cake-style cones came from the supermarket ice cream aisle. Amazingly, they didn’t brown or burn during the baking. The icing is a simple buttercream made with both cream cheese and butter. It took quite a lot to get the look but the kids loved it. And the flavor was far better than canned whipped cream. Be generous with the sprinkles and you have a party. Even worldly-wise 5-year-olds love them. Preheat oven to 350 degrees. Stand cupcake cones upright in either regular or mini muffin tins. Into the work bowl of an electric mixer fitted with a paddle blade, sift together the flour, cocoa powder, sugar, baking soda, baking powder and salt. In a 4 cup glass measure, stir together the 2 eggs, yolk, milk, oil, vanilla and warm water. Add liquid ingredients to dry ingredients and beat on low speed about 3 minutes, until batter is smooth and silky. Rinse out measuring cup and pour a couple of cups of cake batter into it. Slowly pour batter into ice cream cones, filling about 2/3 full. Be careful not to overfill or the batter may overflow the cones during baking. Refill the measure as necessary. If you have more batter than cones, you can bake the remainder in muffin tins with paper liners. Carefully transfer filled cones and tins to oven and bake for 20-30 minutes or until a tester inserted in the center of a cupcake comes out dry and clean. Remove cones from oven and let cool on a wire rack. Frost with icing and shower with sprinkles before serving. Combine cream cheese, butter and vanilla in the work bowl of an electric mixer and beat on high speed with paddle blade until smooth. Reduce mixer speed to low and add a couple of cups of confectioner’s sugar, mix until combined, then raise the speed to medium high until smooth. Add more sugar on low speed and continue beating on medium high until the icing is stiff enough to hold its shape when piped onto the cupcakes but still supple enough to look like soft serve ice cream. You may not need to use all the sugar. Fill a gallon-size zipper-top food storage bag with icing and squeeze all excess air out of the bag before sealing. Snip off about 1/4-inch from the tip of one of the bottom corners with scissors. 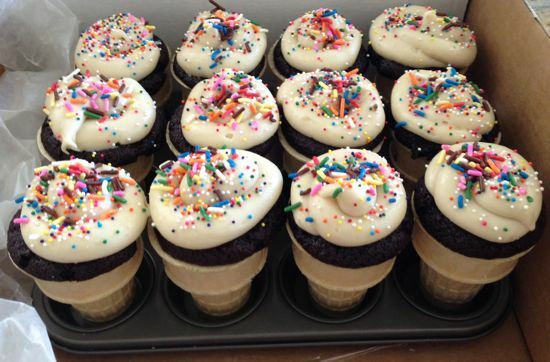 To frost cupcakes, squeeze icing smoothly out of the bag while circling the top of each cone in a swirl pattern.